The Russian Pavilion is presented by Vadim Zakharov and curated by Udo Kittelmann. Vadim Zakharov’s installation “Danaë” turns around the ancient Greek myth and unites the upper and lower floors of the pavilion into a single project – a first in the building’s history. For my taste, the installation is brilliant and clear. And the funny thing about it is that Russians usually don’t like everything made by Russians. But not in this case – I’ve only heard positive responses on the project. And I want to reveal a secret to you – we’re almost sure that we could be awarded the best pavilion this year!
. In 2013 the pavilion takes the form of a “kamikaze loggia” – a self-initiated building form typical in Tbilisi, the capital of Georgia. During the preview days, the Bouillon Group performed “religious aerobics” outside the pavilion on daily basis, with particular movements of the three religions of the world: Islam, Christianity, and Judaism transformed into aerobics. Four international artists from four different countries were invited to contribute to the presentation at the German Pavilion: Ai Weiwei, Romuald Karmakar, Santu Mofokeng, and Dayanita Singh. Curated by Susanne Gaensheimer, the pavilion’s investigation demands time and a willingness to focus, not only because you have to stand in line for a few hours before entrance but also because the works presented by the artists challenge the notion of an unambiguous biography and specific national or cultural identity. 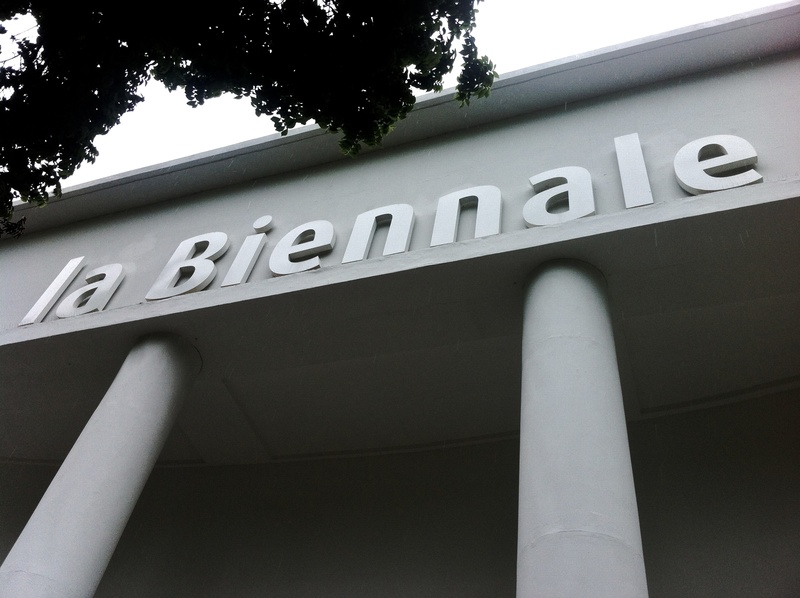 Tags: 55th Venice Biennale, Ai Weiwei, Anastasia Barysheva, art, Austrian art, Austrian pavilion, “Aladdin”, “Beauty and the Beast”, “The Lion King”, Blouin Artinfo, Bouillon, Bouillon Group, contemporary art, Dayanita Singh., georgian art, Georgian Pavilion, German Pavilion, Joanna Warsza, Mathias Poledna, Romuald Karmakar, Russian art, Russian Pavilion at the 55th International Art Exhibition, Santu Mofokeng, Susanne Gaensheimer., Udo Kittelmann, Vadim Zakharov, venice, Venice Biennale. Bookmark the permalink. Previous post ← Turkish “Resistance” Pavilion in Venice – Films To Watch And Videos To See?